A net promoter score is a rating from 0-10 that answers the question ‘how likely are you to recommend us to a friend or colleague?’. This question is followed by ‘Why would you give us this score?’. Anyone who answers 10-9 is considered a ‘promoter’, this means they are satisfied with your product or service enough that they would gladly be willing to promote your company given you provide an easy platform for such promotion. A rating of 8-7 is considered ‘passive’, these users are likely not to go out of their way to promote you but will still use your product. Users who choose 6-0 are considered “detractors”. This subset has not had a great experience with your product or service. Though a rating of 0-6 is never ideal, it can help identify problems with your product or service, promoting positive evolution, and providing an incentive for changing detractors and passives to promoters. 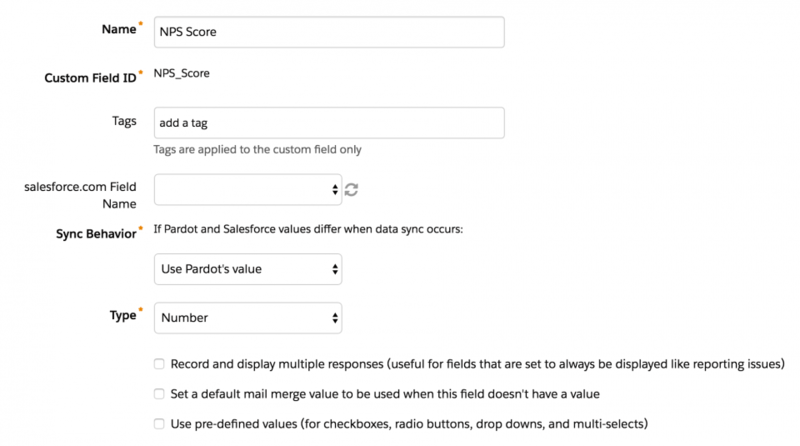 An NPS survey email will be sent out from Pardot that asks the receipient to rate you on a scale from 1 to 10. The recipient clicks on a rating and is directed to a landing page where they can fill out more information on why they gave you that rating. The rating the recipient selected from the email is automatically displayed on the landing page and passed to a hidden field in the form to capture in the Pardot database. 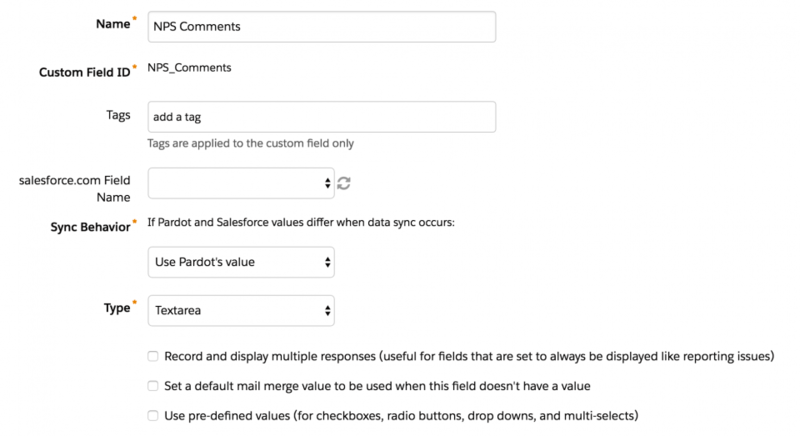 Create new fields in Salesforce and Pardot to capture the NPS results. 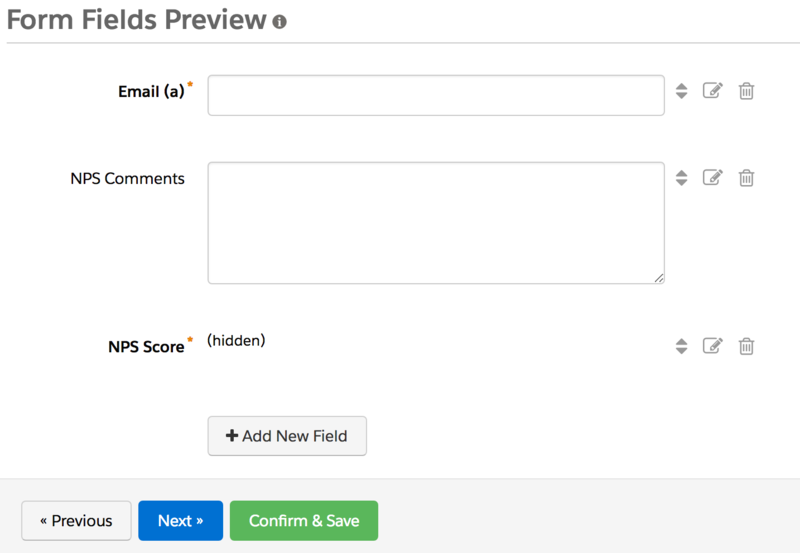 In this example, I will be using a field named NPS Score and NPS Comments. NPS Comments – select textarea as the type and leave it optional. 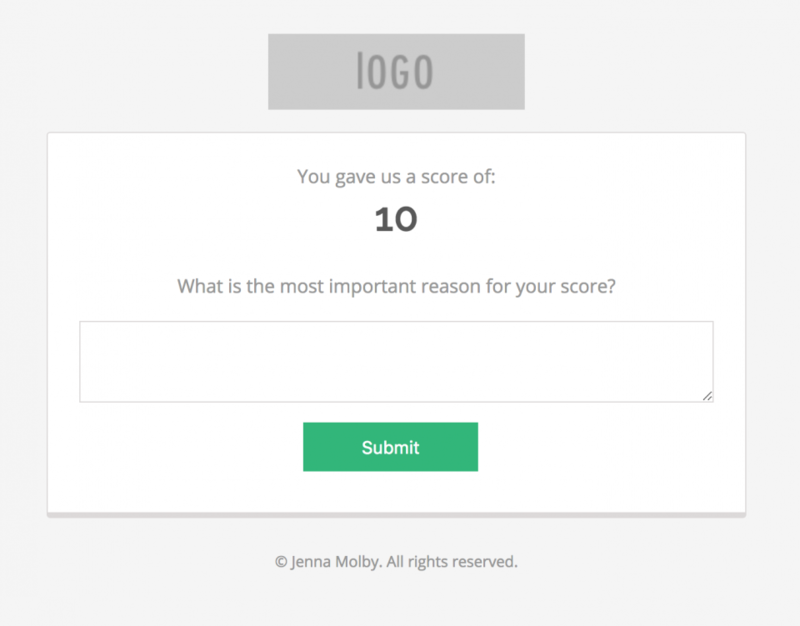 NPS Score – select hidden as the type and mark it has required. 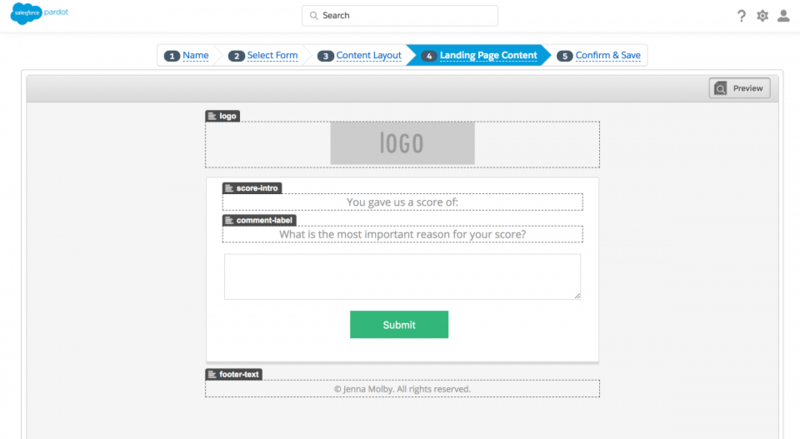 A new layout template will need to be created in order to create the landing page. Here’s the code I used for my layout template. Note: The jQuery library will need to be loaded in order for this to work. The only piece of required CSS is to hide the email field since we will be auto-populating it through the URL. Once your layout template is set up, use it to create a new landing page. Email – The email of the receipent, using a varaible tag. Great guide, thank you. I've run into a bit of a problem though. After completing the NPS survey once, the text box always seems to be invisible if a customer completes the survey a second time. Any insight into why it might be disappearing? Thanks in advance. I followed your steps, question I have is how do I get NPS to update each time we send them NPS (every 6 months)? I am testing and while the NPS updates the first time I click on a score - I test again (with another email sent to same address) and Pardot does not update. Nice idea. 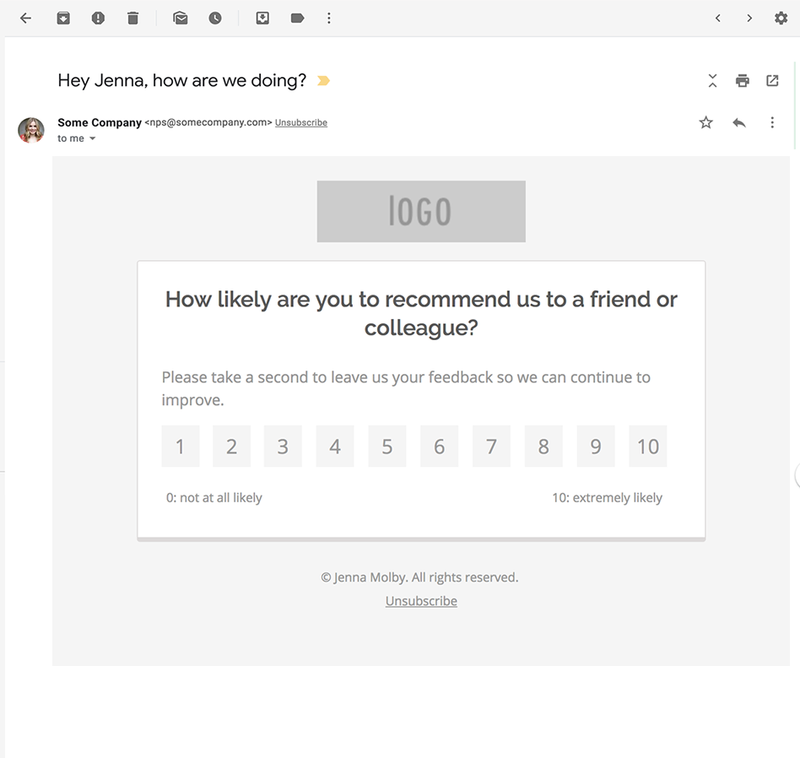 I think you could improve this further by making the email links for the rating ..... have custom redirects with completion actions of setting the NPS score field. So if they click  it goes to a custom redirect that sets the score to 5 and then redirects to the comments landing page. That way if they don't fill out the comments or don't want to we still have a score. Ross, I completely thought the same thing about the custom redirects. I built everything out per Jenna's blog (thanks Jenna ;) but added the Custom Redirects and ran into issue where Pardot will not allow you to include certain words in vanity URL's, including email. Kind of a deal breaker for parsing email address into a hidden email form field. Ideas anyone? This is super helpful - thank you for sharing! Quick question; how do you capture the tracked NPS score over time if the data saves over itself in the SFDC field? Pardot Settings > Object and Field Configuration > Prospect Fields > NPS Score Once your in the field, select the checkbox: "Record and display multiple responses (useful for fields that are set to always be displayed like reporting issues)" Do this both for the score, comments and anything else you want to track multiple entries on. From my testing, it appears it maxes out at 10 DB entries.